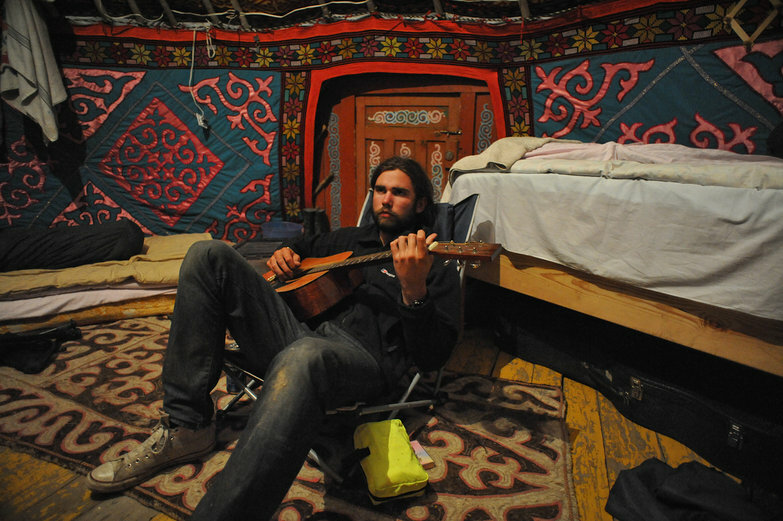 Mongolian Road Trip: Driving the Steppe: Mongolia! It is early afternoon by the time we're prepared to leave the Mongolian border. As we make our way towards the gate, the guards on patrol smile and wave enthusiastically. After we pass them by, the barrier which held us captive in no-man's land last night swings open. We did it! 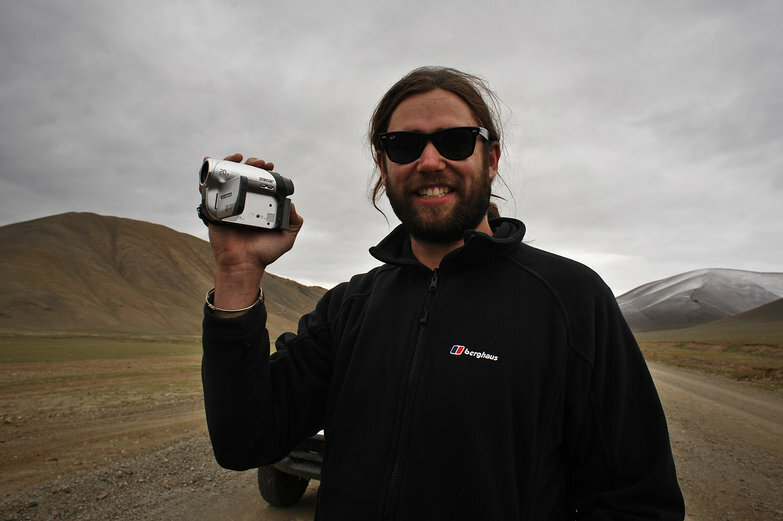 We're in Mongolia! As we cheer and exchange high-fives, the pavement abruptly ends. We can hardly contain our glee, not that we're trying to. Snow dusted mountains fill our vision in three hundred and sixty degrees; how can this be our life?! 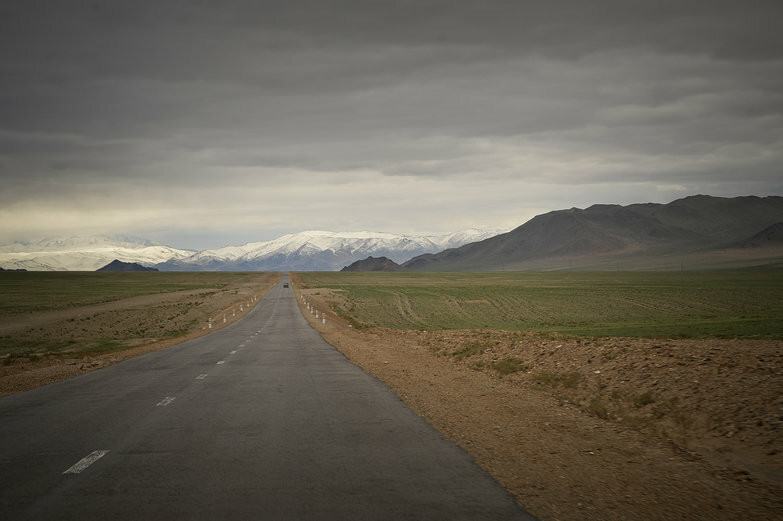 As the border slips beyond the horizon, the dirt track taking us into the heart of Mongolia splits into two, three, and then four paths. They all seem to be going in the same general direction, so we pick the middle one and carry on. As the kilometers tick by, the tracks to our left and right undulate lazily across the rocky landscape, continually weaving, merging and branching across our chosen route. The land itself is as drivable as the tracks are, sometimes moreso; a few of the ralliers venture off-road. We all stop regularly for photos and filming – everyone is giddy with excitement. Soon, the mountain ranges before us merge together, blocking our path to the first destination of our Mongolian adventure, the border town of Ölgii. It looks like our only option is to go straight over them. There are no gentle switchbacks or nicely graded roads. Instead of a long and winding ascent, the gravely, rutted track before us leads sharply up, making for the steepest climb we can remember. Once again, Tara and I look at each other, smirking a little as we agree in unison: I am SO glad we're not on bikes! One by one, we motor up the monstrous climb. Our LRC zips up the rocky track, confidently purring in second gear. The Suzuki and the Fiat follow. At the top, we all gaze downwards, searching for the taxi. After several minutes spent staring in awe at our surroundings, Mette and I trudge back down the hill, looking for a better vantage point, trying ascertain the fate of the cabbies. We don't need to go far – we can't see it yet, but we can hear the beast of a vehicle chugging its way towards us. Moments later, the London taxi appears over the ridge, spewing black smoke from its exhaust, white steam from its ailing radiator, and triumphant cheers from Mu, hanging out of the passenger window. Everyone now successfully at the top, we stop for the first of many mandatory rests, all cracking jokes at the cabbies' expense. Something's wrong with the cab, lads? The radiator, perhaps? 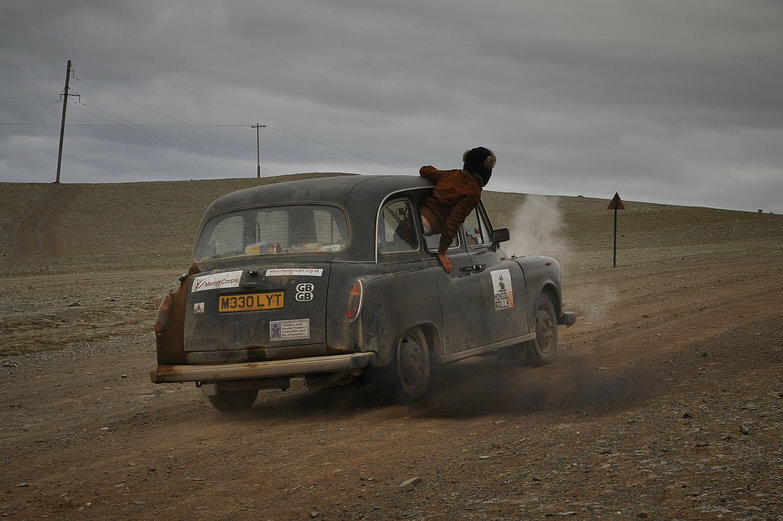 The taxi overheats every few kilometers; water is useless as a coolant at such high altitudes. The lowered boiling temperature ensures the precious liquid will escape as steam even more quickly than usual. 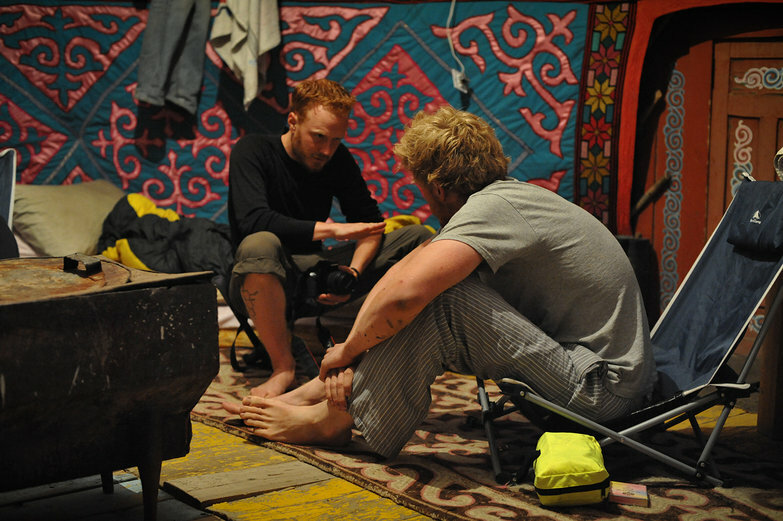 …while Charlie and Mu take their turn filling the radiator. Hopefully we can find some antifreeze in the next town! With the Taxi back in action, we continue onwards. Snowflakes fly through the air as Ölgii appears in the distance. To our surprise, the dirt track we're driving on turns to pavement just outside the city. Arriving in town, everyone needs local currency, so we stop at the first bank we see. Unfortunately, it is closed for the weekend, and there is no unlocked lobby area with an ATM. 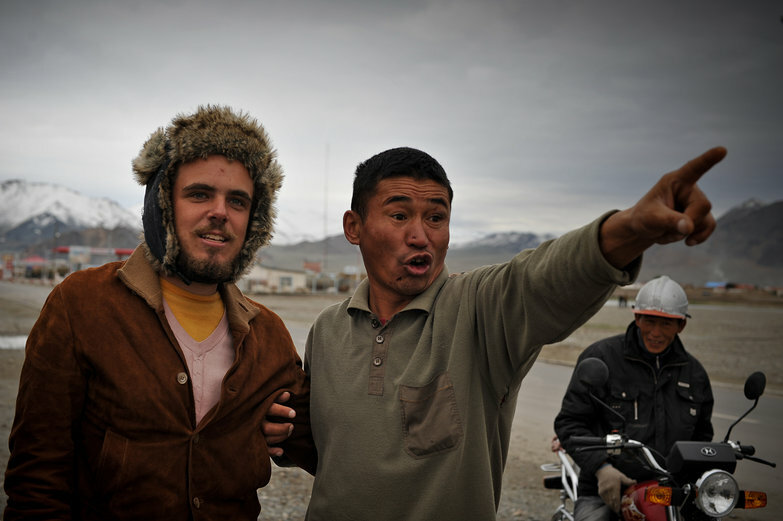 We don't have time to be disappointed; we've been accosted by a friendly, but slightly irksome Mongolian man who arrived on a motorcycle. He wants to take us to his hotel. Not far, not far, he says, pointing the way. In addition to accommodation, he promises a good exchange rate, which he writes with a finger on one of our dirty cars. His offer of 1,500 Tögrög per US dollar is better than the current exchange rate (maybe they don't or can't follow the newest rates out here? ), but none of us want to stay at his hotel. He reminds me of the hagglers in Tunisia, and though he is probably an honest man, he rubs us the wrong way. As we bid him farewell, Mu gets a hug out of the strange encounter. Meanwhile, a group of children have come to say hello. They swarm around us with curiosity, greeting us with smiles, laughter, and a chorus of excited hellos! 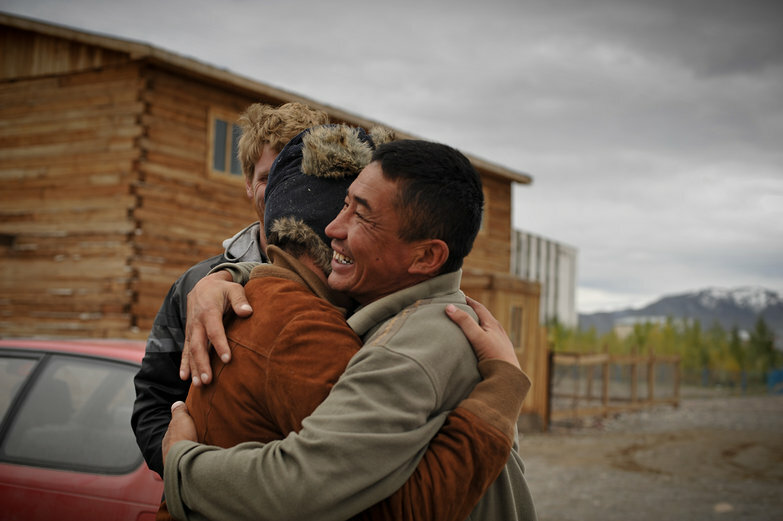 We've grown so used to the typically reserved countenances of Russia, so slow to reveal emotion, that we find ourselves overwhelmed and delighted by the gregarious nature of these Mongolians. On our way again, we reach the center of town where there are open banks and working ATMs. 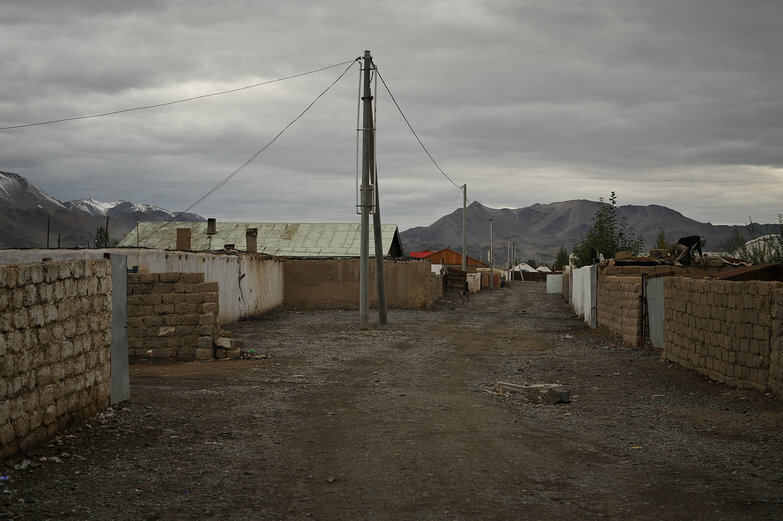 Ölgii, the capital of this Aimag, or region, is large by Mongolian standards. It is hard to imagine that this place, so small and run down (by our standards), is an important locale. While everyone takes turns getting money from the ATM, Mu hauls out his guidebook and begins reading aloud about everything Ölgii has to offer. To be frank, it isn't much. Mu's tongue-in-cheek manner purposefully serves to make the try-hard nature of the writing hilarious. Complete, he moves on to the gay and lesbian section (which is pretty extensive in many guides). 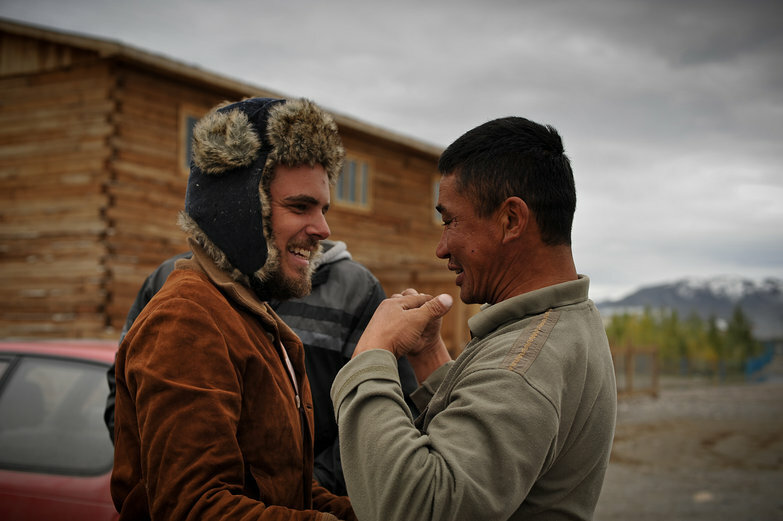 Mongolia's is little more than a sentence or two. Nonexistent. When everyone has finished getting their cash, we head to a pub across the street. It looks more like a restaurant than a bar, but we all spring for a beer. Tara and Mette are starving, so they point to something on the unintelligible menu. We have no idea what it is. 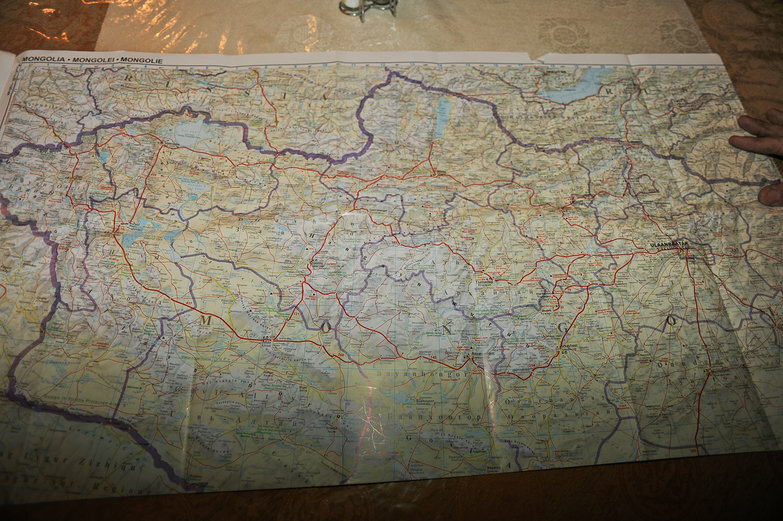 Waiting, we all scrutinize a map of Mongolia. After a few minutes, a woman brings out two plates of mutton meatballs served with salad and rice. Eyes bugging out with food jealousy, we all second guess our decision to stick with beer. Freddie requests another round of what Tara and Mette had ordered, but the woman refuses! Maybe she is annoyed that we didn't order together? We can't figure it out. It is about 6:15 PM, not exactly a normal time to close the kitchen. Though we persist, the waitress won't relent. We all look on longingly as Tara and Mette finish up their delicious-looking platters of food. 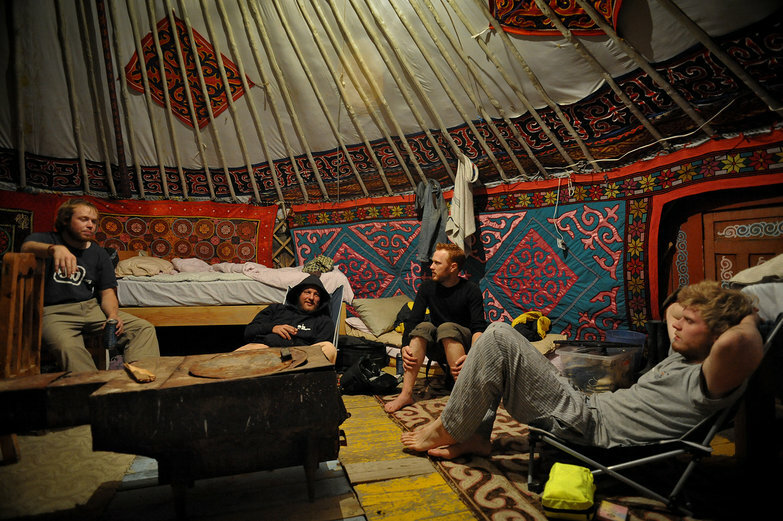 We decide as a group to stay in Ölgii for the night instead of continuing onwards. Tomorrow, we'll head to the next major regional capital, Hovd. It is less than 300 kilometers away, so it should only take us a day of driving to reach it. The only thing left to do today: find a place to sleep. 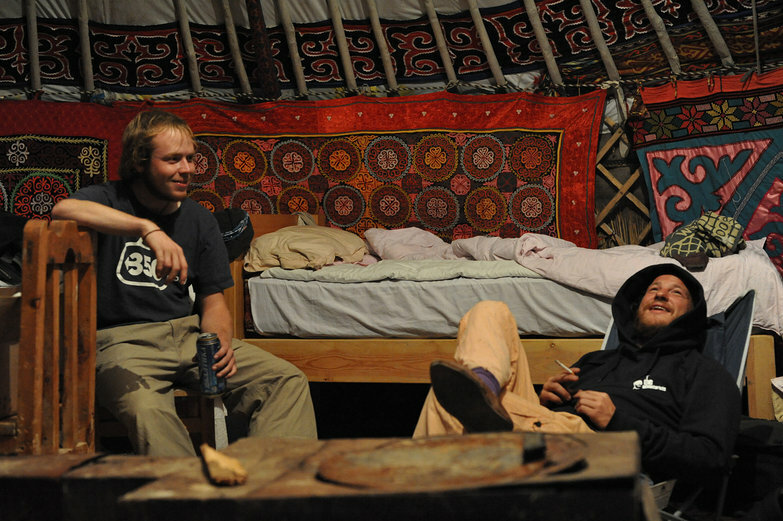 With the help of our guidebooks, we find the Blue Wolf Ger Camp located in Olgii proper. It doesn't look like much from the outside – a patch of dirt with a few round, white gers on it, a dirty barking dog chained nearby, and a wooden outhouse with a creaky door holding in clouds of flies and an awful stench. We're about to deem the place abandoned, when a woman appears to welcome us. We happily learn that there is a clean, western style bathroom. Even better, we are promised hot showers! The inside of our ger is colorful and cozy, and that clinches the deal. 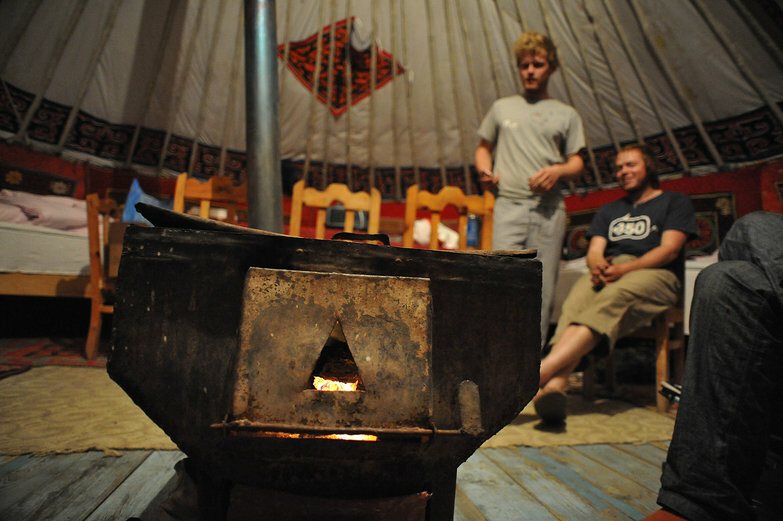 Agreeing on the eight dollar per person fee, we get settled as the woman in charge brings us blankets for the beds, and starts a warming fire in the central stove. As we get settled, each person choosing a bed and making themselves at home, reality slowly sinks in. 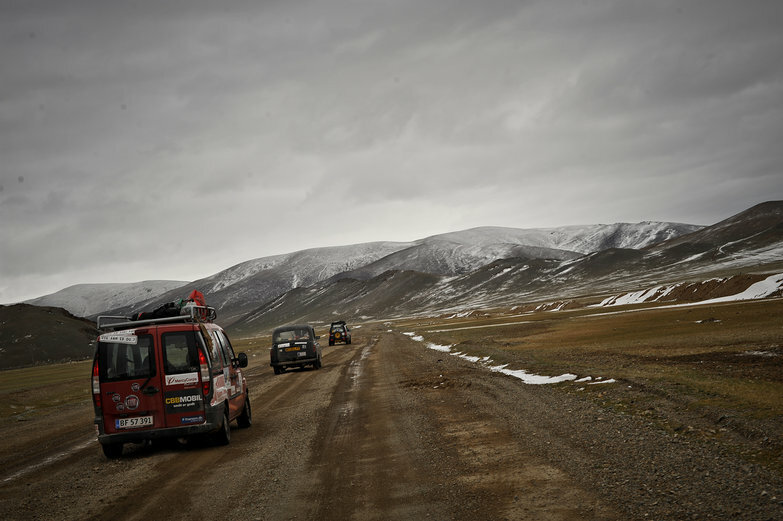 We're here in Mongolia! In a ger! THIS IS SO COOL! Eearly in the evening, I hear a very long pair of shutter clicks come from Richie's camera. When I ask what ISO he is using, he tells me that he hasn't a clue what ISO is. When I ask if he'd like me to explain, he tells me he'd love to hear anything I have to share – this is his first SLR! A little later, Charlie, who has been listening, starts asking loads of questions. Mette joins in too, and soon the four of us are experimenting with our cameras, engaged in a fun conversation about how they work. While I'm busy drawing diagrams to illustrate how depth-of-field works, and explaining the purposes of aperture, shutter and ISO, Tara is on the other side of the ger, attempting to get some journaling done. She doesn't last long, instead tempted by what is becoming a raucous evening of beer drinking and card playing. It is becoming apparent that journaling is going to be impossible if we want to participate in the group. A few weeks ago, we calculated that we now spend nearly forty hours a week writing (concentrated in heavy doses during our days "off")! So, we've decided to take down detailed notes instead. Hopefully we can recapture the events when this stage of our adventure comes to a close. In the meantime, we're immersing ourselves with our new friends as much as possible, deeply enjoying a little socializing after more than a year of living a somewhat insular lifestyle. Cozy and warm with the fire crackling away, enjoying good company over many rounds of beer, we feel very much at home. This is going to be a lot of fun. Hey, was just checking out your website. I got a question for you.......my wife and I are moving to Ulgii to start a school but we have been recently living in Ulaanbaatar. 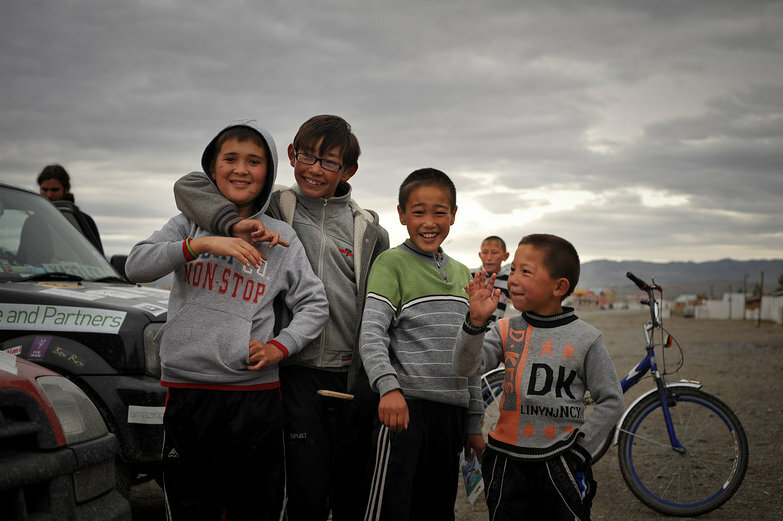 We are planning on driving our truck from Ulaanbaatar to Ulgii in the fall. I'm guessing that you used GPS waypoints for the Mongol Rally. Is there a website of those waypoints or is there a way to get those from you? THanks! Great pictures! Just to let you know......about 95% of the population in Ulgii is Kazakh so those aren't Mongolian gers but instead Kazakh. You can view it on our map page if you want; just click on any marker and use the "route in / route out" links. As for an actual tracklog you could use on a GPS, I'll dig up the file a little later this evening and shoot it you in an email. We're glad you enjoyed the pictures, good luck with your school, and thanks for the info about Ölgii! I think that explains why we never saw the same type of hats at any of the other markets in Mongolia.